The Boolean preferences, found in Preferences >> Union Mesh are mainly settings to improve the way that ZBrush cleans the meshes created by the Boolean process. Changing them can have an impact on how successful your operations will be. It is advised to keep them at their default settings for most purposes and only change them on specific models which may have issues. 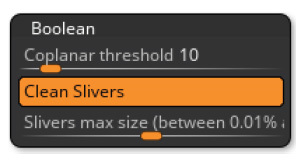 The Coplanar Threshold slider lets you change the detection of the depth of the coplanar faces. If you have fixed the coplanar issues shown by the default values and are still receiving an error message, increasing this slider will show more potential coplanar areas on your model. The Clean Slivers mode (enabled by default) is used to detect and remove tiny, isolated triangles which can happen at some locations after the Boolean process. Even though it is performed with the Boolean operation, it is considered to be a post-process. The Slivers Maximum Size slider defines the maximum size for the detection of sliver triangles when the cleaning process is performed.